The Final Countdown for Miss Ireland 2014 has officially begun! !..Miss Dress Bar- Rebecca Oâ€™Donovan: 19 year old Rebecca is from Cork and is currently working as a florist. She studied Art in UCC but took a year out. Her hobbies are drawing, singing and playing the guitar. She lives with her Mother who she picks as the greatest person in her World. She has 2 Brothers. She would love to travel to China and America to see how others celebrate Christmas...This morning saw all 36 Finalists for the Miss Ireland 2014 in association with Mane n' Tail pageant come together in the Ballsbridge Hotel to kick off the Finale of the competition. Amongst this dazzling array of beautiful ladies awaits the one who will tomorrow evening be crowned Miss Ireland 2014...The lucky girl will be selected at the Gala Final in the Ballsbridge Hotel by the esteemed panel of judges, with highlights of the evening to include a casino for all guests in attendence and a performance by singer/ songwriter and former Ireland representative at the Eurovision, Ryan Dolan...Picture:Brian McEvoy. The Final Countdown for Miss Ireland 2014 has officially begun! !..Miss Buck Whaleyâ€™s- Jessica Hayes: Jessica is 20 years old and hails from Douglas in Cork. She has recently completed a year long Business course at Cork College of Commerce and models with Assets Agency. She can Irish dance and plays a small bit of Piano. This is Jessicaâ€™s 2nd year in the event having been Miss Cork in 2013, but felt she was not prepared last year confidence wise. She sees herself in 5 years time completing her degree and hoping to achieve her maximum potential in modelling...This morning saw all 36 Finalists for the Miss Ireland 2014 in association with Mane n' Tail pageant come together in the Ballsbridge Hotel to kick off the Finale of the competition. Amongst this dazzling array of beautiful ladies awaits the one who will tomorrow evening be crowned Miss Ireland 2014...The lucky girl will be selected at the Gala Final in the Ballsbridge Hotel by the esteemed panel of judges, with highlights of the evening to include a casino for all guests in attendence and a performance by singer/ songwriter and former Ireland representative at the Eurovision, Ryan Dolan...Picture:Brian McEvoy. Miss Cavan- Naoimi Graham: Naomi was born in England but moved to Ireland when she was four years old. She is 21 years of age and self employed. She has 1 Sister and 5 foster Brothers. Her ambition is to have a successful Business and design her own eveningwear range. She enjoys horse riding and can sing. She would see her mother as the greatest person in the World...The Final Countdown for Miss Ireland 2014 has officially begun! !..This morning saw all 36 Finalists for the Miss Ireland 2014 in association with Mane n' Tail pageant come together in the Ballsbridge Hotel to kick off the Finale of the competition. Amongst this dazzling array of beautiful ladies awaits the one who will tomorrow evening be crowned Miss Ireland 2014...The lucky girl will be selected at the Gala Final in the Ballsbridge Hotel by the esteemed panel of judges, with highlights of the evening to include a casino for all guests in attendence and a performance by singer/ songwriter and former Ireland representative at the Eurovision, Ryan Dolan...Picture:Brian McEvoy. The Final Countdown for Miss Ireland 2014 has officially begun! !..Miss Cork- Katie Oâ€™Donoghue: 20 year old Katie is from Bishopstown, Co. Cork. She works in the family business in addition to part time work with Real Nation doing promotional work. She is currently a student at UCC doing a Bachelor of Arts Degree. She has 2 Sisters, and 1 Brother who lives in the UK. She is a goal setter, determined to achieve, and considers herself very focused. Her family are very close and she enjoys working out to relax or walking the Dog. Her hero is Nelson Mandela. She is studying French and she was the runner up of Miss Cork in 2013...This morning saw all 36 Finalists for the Miss Ireland 2014 in association with Mane n' Tail pageant come together in the Ballsbridge Hotel to kick off the Finale of the competition. Amongst this dazzling array of beautiful ladies awaits the one who will tomorrow evening be crowned Miss Ireland 2014...The lucky girl will be selected at the Gala Final in the Ballsbridge Hotel by the esteemed panel of judges, with highlights of the evening to include a casino for all guests in attendence and a performance by singer/ songwriter and former Ireland representative at the Eurovision, Ryan Dolan...Picture:Brian McEvoy. The Final Countdown for Miss Ireland 2014 has officially begun! !..Miss Dublin South- Chelsea Murphy: 20 year old Chelsea is due to start accounting and computer applications in September. Although she doesnâ€™t play sports she likes to keep fit, eat healthily and does some regular jogging. Her short term ambition is to get her college degree. She sees Mary Mc Aleese as the greatest person in the World. She is a qualified beauty therapist and up until recently worked in a salon. She would love to continue a career in modelling. She is from Castle Island and is doing a BA in Fine Art and Ceramic Design. She recently started modelling and works part time in a restaurant. She has one older brother called Daniel. She has studied jazz ballet and won various medals for basketball....This morning saw all 36 Finalists for the Miss Ireland 2014 in association with Mane n' Tail pageant come together in the Ballsbridge Hotel to kick off the Finale of the competition. Amongst this dazzling array of beautiful ladies awaits the one who will tomorrow evening be crowned Miss Ireland 2014...The lucky girl will be selected at the Gala Final in the Ballsbridge Hotel by the esteemed panel of judges, with highlights of the evening to include a casino for all guests in attendence and a performance by singer/ songwriter and former Ireland representative at the Eurovision, Ryan Dolan...Picture:Brian McEvoy. The Final Countdown for Miss Ireland 2014 has officially begun! !..Miss Down- Charlotte Shaw: 20 year old Charlotte is studying speech and language therapy at University of Ulster while working part time in Topshop. She has appeared on Games of Thrones and has been in a relationship for 3 years. She enjoys tennis and cross country running. Her life ambition is to help those with communication difficulties and to one day become a wife and mother. She loves animals and dreams of running a dog sanctuary....This morning saw all 36 Finalists for the Miss Ireland 2014 in association with Mane n' Tail pageant come together in the Ballsbridge Hotel to kick off the Finale of the competition. Amongst this dazzling array of beautiful ladies awaits the one who will tomorrow evening be crowned Miss Ireland 2014...The lucky girl will be selected at the Gala Final in the Ballsbridge Hotel by the esteemed panel of judges, with highlights of the evening to include a casino for all guests in attendence and a performance by singer/ songwriter and former Ireland representative at the Eurovision, Ryan Dolan...Picture:Brian McEvoy. Miss Fermanagh- Roisin McDevitt: Roisin is 20 years of age and is a part time sales assistant and student with the University of Ulster. She wishes to pursue modelling. She has just completed her first year studying Radiography. She enjoys keeping fit and goes walking and swimming regularily. She hopes in five yearrs time to be working as a radiographer...The Final Countdown for Miss Ireland 2014 has officially begun! !..This morning saw all 36 Finalists for the Miss Ireland 2014 in association with Mane n' Tail pageant come together in the Ballsbridge Hotel to kick off the Finale of the competition. Amongst this dazzling array of beautiful ladies awaits the one who will tomorrow evening be crowned Miss Ireland 2014...The lucky girl will be selected at the Gala Final in the Ballsbridge Hotel by the esteemed panel of judges, with highlights of the evening to include a casino for all guests in attendence and a performance by singer/ songwriter and former Ireland representative at the Eurovision, Ryan Dolan...Picture:Brian McEvoy. The Final Countdown for Miss Ireland 2014 has officially begun! !.Miss Antrim-Jayne Higgins: Jayne is 22 years of age and has just graduated from University of Ulster with an honours degree in PR. She models for AR Agency & CMPR Models, dividing her time between Belfast and Dublin. She has two brothers and her Mother once modelled. Her interests include Horse riding on both County and national levels, as well as tennis and yoga. She also enjoys photography and has recently started a course in this. Her talents include acting, playing piano and singing. Her Father is her hero. Every Christmas she volunteers in a nursing home making dinner....This morning saw all 36 Finalists for the Miss Ireland 2014 in association with Mane n' Tail pageant come together in the Ballsbridge Hotel to kick off the Finale of the competition. Amongst this dazzling array of beautiful ladies awaits the one who will tomorrow evening be crowned Miss Ireland 2014...The lucky girl will be selected at the Gala Final in the Ballsbridge Hotel by the esteemed panel of judges, with highlights of the evening to include a casino for all guests in attendence and a performance by singer/ songwriter and former Ireland representative at the Eurovision, Ryan Dolan...Picture:Brian McEvoy. Miss Dublin West- Megan Roberts: 21 year old Megan is from Rialto and will be starting college in September. She enjoys playing tennis. She was in the majorettes, does gymnastics and plays the tin whistle. Her favourite person is her Nanny who sadly passed away. She wants to travel the world and be an independent, successful woman in a variety of different businesses. ..The Final Countdown for Miss Ireland 2014 has officially begun! !..This morning saw all 36 Finalists for the Miss Ireland 2014 in association with Mane n' Tail pageant come together in the Ballsbridge Hotel to kick off the Finale of the competition. Amongst this dazzling array of beautiful ladies awaits the one who will tomorrow evening be crowned Miss Ireland 2014...The lucky girl will be selected at the Gala Final in the Ballsbridge Hotel by the esteemed panel of judges, with highlights of the evening to include a casino for all guests in attendence and a performance by singer/ songwriter and former Ireland representative at the Eurovision, Ryan Dolan...Picture:Brian McEvoy. The Final Countdown for Miss Ireland 2014 has officially begun! !..Miss Armagh- Lisa Maria Casey: Lisa is 23, has two Sisters and is currently training as a pole fitness instructor. She studied animation and would love to go into the performing arts. She has suffered from anxiety but continues to conquer it by pushing herself to fulfil her dreams. She loves her dogs and looks up to her Aunt who returned to education aged 42, starting with her junior cert and who now has a degree. Lisa also enjoys playing the guitar. ..This morning saw all 36 Finalists for the Miss Ireland 2014 in association with Mane n' Tail pageant come together in the Ballsbridge Hotel to kick off the Finale of the competition. Amongst this dazzling array of beautiful ladies awaits the one who will tomorrow evening be crowned Miss Ireland 2014...The lucky girl will be selected at the Gala Final in the Ballsbridge Hotel by the esteemed panel of judges, with highlights of the evening to include a casino for all guests in attendence and a performance by singer/ songwriter and former Ireland representative at the Eurovision, Ryan Dolan...Picture:Brian McEvoy. The Final Countdown for Miss Ireland 2014 has officially begun! !..Miss Hush Nightclub- Shannen Reilly McGrath: 20 year old Shannen is from Tallaght and is employed at Garveys Dental Surgery training to become a dental nurse. She has been dancing since the age of 3 and competed in Freestyle dance both in Ireland and UK. She is a qualified beauty therapist. Her hobbies are dancing, swimming and running. She has always looked up to Princess Diana and is hoping to go to UCD to study Psychology in September. .This morning saw all 36 Finalists for the Miss Ireland 2014 in association with Mane n' Tail pageant come together in the Ballsbridge Hotel to kick off the Finale of the competition. Amongst this dazzling array of beautiful ladies awaits the one who will tomorrow evening be crowned Miss Ireland 2014...The lucky girl will be selected at the Gala Final in the Ballsbridge Hotel by the esteemed panel of judges, with highlights of the evening to include a casino for all guests in attendence and a performance by singer/ songwriter and former Ireland representative at the Eurovision, Ryan Dolan...Picture:Brian McEvoy. The Final Countdown for Miss Ireland 2014 has officially begun! !..Miss Galway- Leah Tiernan: 20 year old Leah is from Knocknacarra, Galway . She works full time in a Ladies Boutique called PIA. She has four Brothers. She studied Ballet for 10 years and fashion design for 2 years. She was involved in the PR /Marketing for the Vovlo Ocean Race. She enjoys racket sports and would love to carve out a successful career in modelling that could lead into TV presenting. Her Mum is her inspiration...This morning saw all 36 Finalists for the Miss Ireland 2014 in association with Mane n' Tail pageant come together in the Ballsbridge Hotel to kick off the Finale of the competition. Amongst this dazzling array of beautiful ladies awaits the one who will tomorrow evening be crowned Miss Ireland 2014...The lucky girl will be selected at the Gala Final in the Ballsbridge Hotel by the esteemed panel of judges, with highlights of the evening to include a casino for all guests in attendence and a performance by singer/ songwriter and former Ireland representative at the Eurovision, Ryan Dolan...Picture:Brian McEvoy. The Final Countdown for Miss Ireland 2014 has officially begun! !..Miss Dublin North- Lisa Hogan: 21 year old Lisa is currently a junior hairdresser. She attended a performing arts college in Bray, has one Sister and enjoys Skiing and Gymnastics. Her ambition is to be successful, happy and financially secure. She hopes to open her own dance studio. She has lots of role models but especially admires Katie Taylor...This morning saw all 36 Finalists for the Miss Ireland 2014 in association with Mane n' Tail pageant come together in the Ballsbridge Hotel to kick off the Finale of the competition. Amongst this dazzling array of beautiful ladies awaits the one who will tomorrow evening be crowned Miss Ireland 2014...The lucky girl will be selected at the Gala Final in the Ballsbridge Hotel by the esteemed panel of judges, with highlights of the evening to include a casino for all guests in attendence and a performance by singer/ songwriter and former Ireland representative at the Eurovision, Ryan Dolan...Picture:Brian McEvoy. The Final Countdown for Miss Ireland 2014 has officially begun! !..Miss Kildare- Sara Kavanagh: 21 year old Sarah is a trainee hairdresser with Peter Mark but studied fashion buying and merchandising in Crumlin College. She has 2 Brothers, enjoys jogging and socialising with friends. She admired Princess Diana and has found being involved in Miss Ireland as extremely confidence building. ..This morning saw all 36 Finalists for the Miss Ireland 2014 in association with Mane n' Tail pageant come together in the Ballsbridge Hotel to kick off the Finale of the competition. Amongst this dazzling array of beautiful ladies awaits the one who will tomorrow evening be crowned Miss Ireland 2014...The lucky girl will be selected at the Gala Final in the Ballsbridge Hotel by the esteemed panel of judges, with highlights of the evening to include a casino for all guests in attendence and a performance by singer/ songwriter and former Ireland representative at the Eurovision, Ryan Dolan...Picture:Brian McEvoy. The Final Countdown for Miss Ireland 2014 has officially begun! 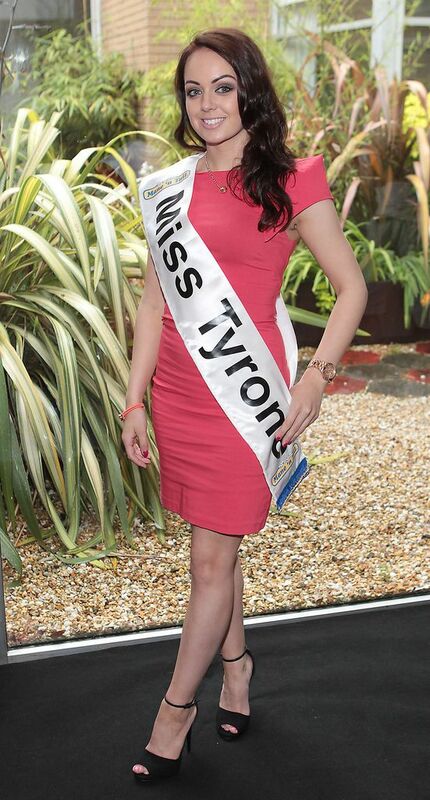 !.Miss Laois- Lorraine Tubridy: 17 yr old Lorraine is a boxer and has trained with Katie Taylor and Bernard Dunne. She is an only Girl with 3 Brothers. She loves anything to do with sports and one day would love to win an All Ireland medal and follow this with opening her own beauty school. She is a nail technician and feels she is a chatty, outgoing person. ...This morning saw all 36 Finalists for the Miss Ireland 2014 in association with Mane n' Tail pageant come together in the Ballsbridge Hotel to kick off the Finale of the competition. Amongst this dazzling array of beautiful ladies awaits the one who will tomorrow evening be crowned Miss Ireland 2014...The lucky girl will be selected at the Gala Final in the Ballsbridge Hotel by the esteemed panel of judges, with highlights of the evening to include a casino for all guests in attendence and a performance by singer/ songwriter and former Ireland representative at the Eurovision, Ryan Dolan...Picture:Brian McEvoy. The Final Countdown for Miss Ireland 2014 has officially begun! !..Miss Meath- Aoife Mc Grane: 20 year old Aoife is from Ashbourne, Co Meath and is an only Girl with 2 Brothers. She is currently in DCU and is working part time as a waitress. Her family are big into music- both her father and her brother are in bands. Her talents are Irish Dancing, Hip Hop dancing, playing the guitar and playing the Ukulele. She studied fashion design for a year but has chosen to go down a more scientific route for her future studies. ..This morning saw all 36 Finalists for the Miss Ireland 2014 in association with Mane n' Tail pageant come together in the Ballsbridge Hotel to kick off the Finale of the competition. Amongst this dazzling array of beautiful ladies awaits the one who will tomorrow evening be crowned Miss Ireland 2014...The lucky girl will be selected at the Gala Final in the Ballsbridge Hotel by the esteemed panel of judges, with highlights of the evening to include a casino for all guests in attendence and a performance by singer/ songwriter and former Ireland representative at the Eurovision, Ryan Dolan...Picture:Brian McEvoy. The Final Countdown for Miss Ireland 2014 has officially begun! !.Miss Limerick- Grace Walsh: Grace is 21 and is currently working in O Reillyâ€™s Hair and Beauty Supplies. She studied as a beauty therapist. As a child she was a dancer until the age of 15 and now enjoys jogging. She wishes to travel to Australia and admires Angelina Jolie. She hopes in five years time to have her own beauty salon...This morning saw all 36 Finalists for the Miss Ireland 2014 in association with Mane n' Tail pageant come together in the Ballsbridge Hotel to kick off the Finale of the competition. Amongst this dazzling array of beautiful ladies awaits the one who will tomorrow evening be crowned Miss Ireland 2014...The lucky girl will be selected at the Gala Final in the Ballsbridge Hotel by the esteemed panel of judges, with highlights of the evening to include a casino for all guests in attendence and a performance by singer/ songwriter and former Ireland representative at the Eurovision, Ryan Dolan...Picture:Brian McEvoy. The Final Countdown for Miss Ireland 2014 has officially begun! !..Miss Kilkenny- Sarah Jane Dunne: 24 year old Sarah has just graduated fromTrinity as a secondary School teacher in English and Religion. Her Father was well known Irish musician Pecker Dunne and she herself can play the violin and concertina. She would love to use her education and experience to work alongside children from impoverished areas. She loves music, running and hill walking. Although she can sing she is trying to overcome her fears of singing in public. ..This morning saw all 36 Finalists for the Miss Ireland 2014 in association with Mane n' Tail pageant come together in the Ballsbridge Hotel to kick off the Finale of the competition. Amongst this dazzling array of beautiful ladies awaits the one who will tomorrow evening be crowned Miss Ireland 2014...The lucky girl will be selected at the Gala Final in the Ballsbridge Hotel by the esteemed panel of judges, with highlights of the evening to include a casino for all guests in attendence and a performance by singer/ songwriter and former Ireland representative at the Eurovision, Ryan Dolan...Picture:Brian McEvoy. The Final Countdown for Miss Ireland 2014 has officially begun! !..Miss Louth- Fionnuala Short: 17 year old Fionnuala is from Dundalk, Co Louth and is currently working at Leavyâ€™s Pharmacy. She has one brother, one sister and her father is the local school principal. She is a fluent Irish speaker, writes a blog and her cousin is US actor Martin Short. Her mum is her inspiration, who has been battling breast and lung cancer for the last year. She would love to carve out a career in TV. She would call herself a bookworm and hopes in five years time to finish college with a degree in communications...This morning saw all 36 Finalists for the Miss Ireland 2014 in association with Mane n' Tail pageant come together in the Ballsbridge Hotel to kick off the Finale of the competition. Amongst this dazzling array of beautiful ladies awaits the one who will tomorrow evening be crowned Miss Ireland 2014...The lucky girl will be selected at the Gala Final in the Ballsbridge Hotel by the esteemed panel of judges, with highlights of the evening to include a casino for all guests in attendence and a performance by singer/ songwriter and former Ireland representative at the Eurovision, Ryan Dolan...Picture:Brian McEvoy. The Final Countdown for Miss Ireland 2014 has officially begun! !..Miss Roscommon- Ruth Mc Court: 23 Year old Ruth is currently working in River Island. She studied at Galway â€“Mayo Institute of Technology where she has just completed a Business degree. She is the only girl in the Family and has 2 Brothers. She used to play the tin whistle and enjoyed Irish dancing. Her Boyfriend is missing out on going to the UFC to support her at Miss Ireland. She would love to get more into modelling in the future...This morning saw all 36 Finalists for the Miss Ireland 2014 in association with Mane n' Tail pageant come together in the Ballsbridge Hotel to kick off the Finale of the competition. Amongst this dazzling array of beautiful ladies awaits the one who will tomorrow evening be crowned Miss Ireland 2014...The lucky girl will be selected at the Gala Final in the Ballsbridge Hotel by the esteemed panel of judges, with highlights of the evening to include a casino for all guests in attendence and a performance by singer/ songwriter and former Ireland representative at the Eurovision, Ryan Dolan...Picture:Brian McEvoy. The Final Countdown for Miss Ireland 2014 has officially begun! !..Miss Kerry- Sinead Oâ€™Hanlon: 18 year old Sinead is from Listowel in Kerry and is currently working in hospitality. She has just finished studying Beauty and Body therapy in the Institute of Waterford. She has one older Sister. Her Grand Father was an all Ireland basketball champion, her Aunt set up an orphanage in Cape Town and a relation of hers was Miss Kerry in the 60â€™s. She used to be involved in gymnastics and soccer but gave them up to concentrate on her studies. Her Mother is the most important person to her in the World...This morning saw all 36 Finalists for the Miss Ireland 2014 in association with Mane n' Tail pageant come together in the Ballsbridge Hotel to kick off the Finale of the competition. Amongst this dazzling array of beautiful ladies awaits the one who will tomorrow evening be crowned Miss Ireland 2014...The lucky girl will be selected at the Gala Final in the Ballsbridge Hotel by the esteemed panel of judges, with highlights of the evening to include a casino for all guests in attendence and a performance by singer/ songwriter and former Ireland representative at the Eurovision, Ryan Dolan...Picture:Brian McEvoy. The Final Countdown for Miss Ireland 2014 has officially begun! !.Miss Clare- Kate Mc Glennon: Kate is 20 from Inagh, Co Clare. She is currently training to be a midwife. She has 2 Brothers and 2 Sisters who are all younger than herself. She enjoys swimming and is a former member of the Lahinch Swimming club. She enjoys singing and has been the lead in local musicals. She enjoys using her title to gain exposure for local charities. In her dreams she sees herself as a former Miss Ireland....This morning saw all 36 Finalists for the Miss Ireland 2014 in association with Mane n' Tail pageant come together in the Ballsbridge Hotel to kick off the Finale of the competition. Amongst this dazzling array of beautiful ladies awaits the one who will tomorrow evening be crowned Miss Ireland 2014...The lucky girl will be selected at the Gala Final in the Ballsbridge Hotel by the esteemed panel of judges, with highlights of the evening to include a casino for all guests in attendence and a performance by singer/ songwriter and former Ireland representative at the Eurovision, Ryan Dolan...Picture:Brian McEvoy. Miss Westmeath- Niamh Mc Mahon: 20 year old Niamh is a beauty therapist and she has 2 Brothers and 1 Sister. She enjoys Ladies GAA, swimming, running and dancing. She has taken part in many dance shows and enjoys being on stage. She lives every day as it comes as she believes life is too short for regrets...Pic : Brian McEvoy. The Final Countdown for Miss Ireland 2014 has officially begun! !..Miss Derry- Dearbhla Walsh: 20 Yr old Dearbhla is studying to be Quantity Surveyor at Letterkenny Institute. She has 2 Brothers, 1 Sister and her Father is a Guard. Her eldest Brother is a professional soccer player in New Zealand and Dearbhla herself enjoys Horse riding and Ladies GAA. 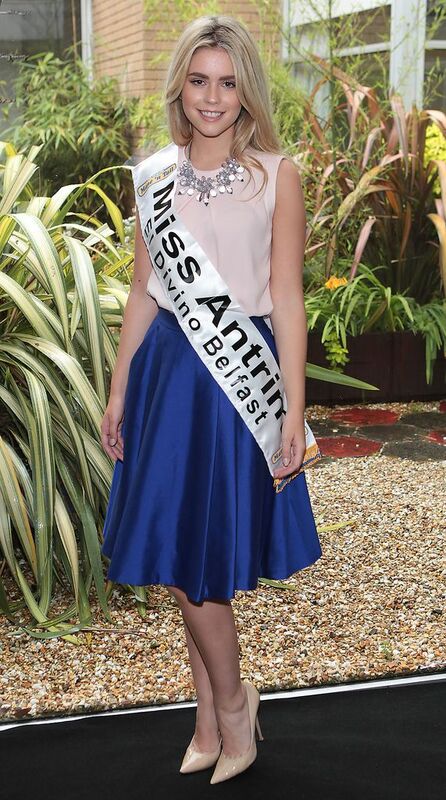 Her ambition is to win Miss Ireland and she is honoured to be representing Derry. She says she is thick skinned and not afraid to break a nail...This morning saw all 36 Finalists for the Miss Ireland 2014 in association with Mane n' Tail pageant come together in the Ballsbridge Hotel to kick off the Finale of the competition. Amongst this dazzling array of beautiful ladies awaits the one who will tomorrow evening be crowned Miss Ireland 2014...The lucky girl will be selected at the Gala Final in the Ballsbridge Hotel by the esteemed panel of judges, with highlights of the evening to include a casino for all guests in attendence and a performance by singer/ songwriter and former Ireland representative at the Eurovision, Ryan Dolan...Picture:Brian McEvoy. The Final Countdown for Miss Ireland 2014 has officially begun! !..Miss Tyrone- Aisling Dougan Cleary: 20 year old Aisling just finished her degree in Psychology from University of Ulster and is currently working part time in a local newsagent. She likes to keep fit with boot camp classes and has a keen interest in make- up, having recently completed a course in this. She loves to dance and studied tap when she was younger. She worked in Romania in an orphanage in 2010...This morning saw all 36 Finalists for the Miss Ireland 2014 in association with Mane n' Tail pageant come together in the Ballsbridge Hotel to kick off the Finale of the competition. Amongst this dazzling array of beautiful ladies awaits the one who will tomorrow evening be crowned Miss Ireland 2014...The lucky girl will be selected at the Gala Final in the Ballsbridge Hotel by the esteemed panel of judges, with highlights of the evening to include a casino for all guests in attendence and a performance by singer/ songwriter and former Ireland representative at the Eurovision, Ryan Dolan...Picture:Brian McEvoy. The Final Countdown for Miss Ireland 2014 has officially begun! !..2fmâ€™s Miss Personality- Laura Mc Cormack: 19 year old Laura is from Edenderry, Co Offaly and is Irelandâ€™s first ever entrant who was voted as a finalist based purely on personality. Laura works part time in Supermacs and is currently studying in the National College of Ireland. She is hugely involved in Ladies GAA. Her Grandfather has two all Ireland medals for Offaly. She enjoys reading, knitting, sewing and embroidery. She is a vegetarian and loves Swimming...This morning saw all 36 Finalists for the Miss Ireland 2014 in association with Mane n' Tail pageant come together in the Ballsbridge Hotel to kick off the Finale of the competition. Amongst this dazzling array of beautiful ladies awaits the one who will tomorrow evening be crowned Miss Ireland 2014...The lucky girl will be selected at the Gala Final in the Ballsbridge Hotel by the esteemed panel of judges, with highlights of the evening to include a casino for all guests in attendence and a performance by singer/ songwriter and former Ireland representative at the Eurovision, Ryan Dolan...Picture:Brian McEvoy. The Final Countdown for Miss Ireland 2014 has officially begun! !..Miss Carlow- Fiona Foley: 23 year old Fiona is from Garryhill, Co. Carlow and is currently working as a merchandiser with Evans at Shaws. She has 6 Brothers and 2 Sisters. Her Uncle is a famous horse trainer and her father won the All Ireland Putting Championship for 3 years running in Mount Juliet golf club. She enjoys badminton, basketball, fishing and sketching. She sites Oprah Winfrey as the best person in the World. Her goal is to achieve a high grade in her Pharmaceutical Degree ..This morning saw all 36 Finalists for the Miss Ireland 2014 in association with Mane n' Tail pageant come together in the Ballsbridge Hotel to kick off the Finale of the competition. Amongst this dazzling array of beautiful ladies awaits the one who will tomorrow evening be crowned Miss Ireland 2014...The lucky girl will be selected at the Gala Final in the Ballsbridge Hotel by the esteemed panel of judges, with highlights of the evening to include a casino for all guests in attendence and a performance by singer/ songwriter and former Ireland representative at the Eurovision, Ryan Dolan...Picture:Brian McEvoy. The Final Countdown for Miss Ireland 2014 has officially begun! 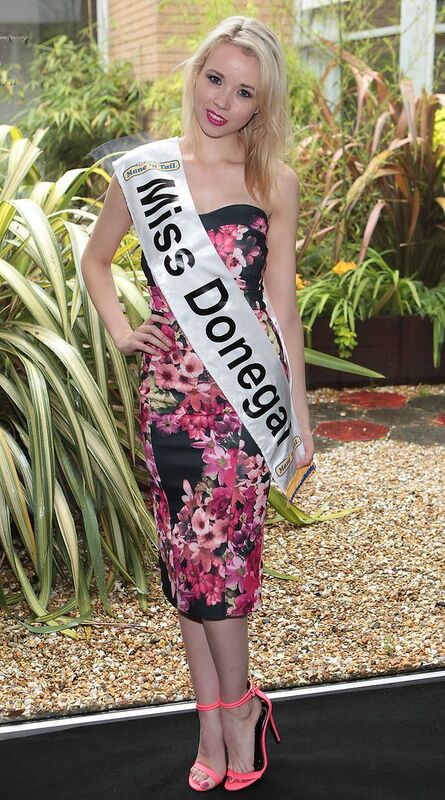 !..Miss Donegal- Emma Kane: Emma is 22 and from Letterkenny. She has one younger Sister. She is a keen sports player and loves to rollerblade, horse ride and is an avid cook. She can play Piano to a high standard. She has three goals which she hopes to achieve in 5 years time: 1, to educate herself to become a more diverse and rounded person; 2, to meet other people with the same career interests; and 3 ,to receive her degree. ..This morning saw all 36 Finalists for the Miss Ireland 2014 in association with Mane n' Tail pageant come together in the Ballsbridge Hotel to kick off the Finale of the competition. Amongst this dazzling array of beautiful ladies awaits the one who will tomorrow evening be crowned Miss Ireland 2014...The lucky girl will be selected at the Gala Final in the Ballsbridge Hotel by the esteemed panel of judges, with highlights of the evening to include a casino for all guests in attendence and a performance by singer/ songwriter and former Ireland representative at the Eurovision, Ryan Dolan...Picture:Brian McEvoy. The Final Countdown for Miss Ireland 2014 has officially begun! !..Miss Tipperary- Linda Creedon: Linda is 21 and recently completed her 3rd year of general nursing at UCC. She works at Maryborough Nursing Home. She is the middle Child and has 2 Sisters. She studied ballet for 14 years under RAD and IDTA. She is passionate about health and fitness, and has a keen interest in fashion. She believes that the greatest person in the World is the writer â€˜Maya Angelouâ€™ who recently passed away. She has just returned from Tanzania where she was volunteering in a regional Hospital...This morning saw all 36 Finalists for the Miss Ireland 2014 in association with Mane n' Tail pageant come together in the Ballsbridge Hotel to kick off the Finale of the competition. Amongst this dazzling array of beautiful ladies awaits the one who will tomorrow evening be crowned Miss Ireland 2014...The lucky girl will be selected at the Gala Final in the Ballsbridge Hotel by the esteemed panel of judges, with highlights of the evening to include a casino for all guests in attendence and a performance by singer/ songwriter and former Ireland representative at the Eurovision, Ryan Dolan...Picture:Brian McEvoy. The Final Countdown for Miss Ireland 2014 has officially begun! !..Miss Dublin City-Kim Mc Dermot: 21 year old Kim is from Dublin and employed with Boots as a No 7 advisor. She loves to dance and has been doing so since the age of 4. Her ambition is to be successful in the fashion and beauty industry. She admits her Mother is the centre of her world, who does absolutely everything for her. She wants to advance herself in her current job but would love to pursue modelling also...This morning saw all 36 Finalists for the Miss Ireland 2014 in association with Mane n' Tail pageant come together in the Ballsbridge Hotel to kick off the Finale of the competition. Amongst this dazzling array of beautiful ladies awaits the one who will tomorrow evening be crowned Miss Ireland 2014...The lucky girl will be selected at the Gala Final in the Ballsbridge Hotel by the esteemed panel of judges, with highlights of the evening to include a casino for all guests in attendence and a performance by singer/ songwriter and former Ireland representative at the Eurovision, Ryan Dolan...Picture:Brian McEvoy. The Final Countdown for Miss Ireland 2014 has officially begun! !..Miss Show Dublin- Andrea Rooney: 18 year old Andrea is from Ringsend, Dublin 4 and works part time with NoPolka.com. She wishes to get more into modelling and feels the Miss Ireland experience has helped her come out of her shell. She lists singing and dancing as her talents. She hopes to see herself as a successful model in 5 years time...This morning saw all 36 Finalists for the Miss Ireland 2014 in association with Mane n' Tail pageant come together in the Ballsbridge Hotel to kick off the Finale of the competition. Amongst this dazzling array of beautiful ladies awaits the one who will tomorrow evening be crowned Miss Ireland 2014...The lucky girl will be selected at the Gala Final in the Ballsbridge Hotel by the esteemed panel of judges, with highlights of the evening to include a casino for all guests in attendence and a performance by singer/ songwriter and former Ireland representative at the Eurovision, Ryan Dolan...Picture:Brian McEvoy. The Final Countdown for Miss Ireland 2014 has officially begun! !..Miss Sunday World- Laura Fox: 23 yr old Laura is from Galway and previously held the Miss Galway title in 2013. She works as a hostess and event planner with â€˜Monroes Liveâ€™ in Galway and recently signed to Assets modelling agency following her year as Miss Galway. She has 2 Brothers and 1 Sister. She completed a PR / Advertising course and would love to break into TV Presenting. Her life ambition is to make the most of every minute of her life, having lost 2 friends recently which made her realize not to take things for granted. ..This morning saw all 36 Finalists for the Miss Ireland 2014 in association with Mane n' Tail pageant come together in the Ballsbridge Hotel to kick off the Finale of the competition. Amongst this dazzling array of beautiful ladies awaits the one who will tomorrow evening be crowned Miss Ireland 2014...The lucky girl will be selected at the Gala Final in the Ballsbridge Hotel by the esteemed panel of judges, with highlights of the evening to include a casino for all guests in attendence and a performance by singer/ songwriter and former Ireland representative at the Eurovision, Ryan Dolan...Picture:Brian McEvoy. The Final Countdown for Miss Ireland 2014 has officially begun! !..Miss Wicklow- Rowena Kenny: Rowena is 18 years of age and is from Arklow, Co. Wicklow. She lived for one year in Perth, Australia after the death of her Father. She is a student nurse in UCD and is a part time carer for â€˜Nurse on Callâ€™. She has one brother, to whom she is extremely close, as well as having a wonderful relationship with her Mum. She lists her Mother as her inspiration. She enjoys running and hill walking with her family in Wicklow. Her ambition is to make a positive impact on people through nursing. She admires Angelina Jolie and Audrey Hepburn for their tireless humanitarian work. .This morning saw all 36 Finalists for the Miss Ireland 2014 in association with Mane n' Tail pageant come together in the Ballsbridge Hotel to kick off the Finale of the competition. Amongst this dazzling array of beautiful ladies awaits the one who will tomorrow evening be crowned Miss Ireland 2014...The lucky girl will be selected at the Gala Final in the Ballsbridge Hotel by the esteemed panel of judges, with highlights of the evening to include a casino for all guests in attendence and a performance by singer/ songwriter and former Ireland representative at the Eurovision, Ryan Dolan...Picture:Brian McEvoy. The Final Countdown for Miss Ireland 2014 has officially begun! !..Miss Waterford- Natasha Rana: 23 year old Natasha was born in Ohio, USA and moved to Ireland in 1991. Her Father is from India and she has one sister. Her family have been involved with fostering children for the last 13 years. She has completed 3 different qualifications in UCC, and has a BA in Geography and Psychology. She most recently received a First class Masters in Management and Marketing, and a post grad diploma in education. Following two years of suffering health ups and downs, she is now extremely appreciative of life and makes sure to enjoy everyday. She loves dress design and customising furniture. ..This morning saw all 36 Finalists for the Miss Ireland 2014 in association with Mane n' Tail pageant come together in the Ballsbridge Hotel to kick off the Finale of the competition. Amongst this dazzling array of beautiful ladies awaits the one who will tomorrow evening be crowned Miss Ireland 2014...The lucky girl will be selected at the Gala Final in the Ballsbridge Hotel by the esteemed panel of judges, with highlights of the evening to include a casino for all guests in attendence and a performance by singer/ songwriter and former Ireland representative at the Eurovision, Ryan Dolan...Picture:Brian McEvoy. The Final Countdown for Miss Ireland 2014 has officially begun! !..Miss Monaghan- Jessica Drohan: 19 yr old Jessica is from Tully, Monaghan and is currently studying PE with Biology in DCU. She has been a member of Monaghan Harps Ladies GAA for 10years and has silver and bronze awards in the GAISCE â€“Presidentâ€™s Award. She is now very focused on athletics and wants to combine her love for athletics with education and believes everyone has the right to education regardless of ability. She is a fluent Irish speaker and looks up to her Parents. She admires Jessica Ennis for all her sporting achievements....This morning saw all 36 Finalists for the Miss Ireland 2014 in association with Mane n' Tail pageant come together in the Ballsbridge Hotel to kick off the Finale of the competition. Amongst this dazzling array of beautiful ladies awaits the one who will tomorrow evening be crowned Miss Ireland 2014...The lucky girl will be selected at the Gala Final in the Ballsbridge Hotel by the esteemed panel of judges, with highlights of the evening to include a casino for all guests in attendence and a performance by singer/ songwriter and former Ireland representative at the Eurovision, Ryan Dolan...Picture:Brian McEvoy. The Final Countdown for Miss Ireland 2014 has officially begun! !..This morning saw all 36 Finalists for the Miss Ireland 2014 in association with Mane n' Tail pageant come together in the Ballsbridge Hotel to kick off the Finale of the competition. Amongst this dazzling array of beautiful ladies awaits the one who will tomorrow evening be crowned Miss Ireland 2014...The lucky girl will be selected at the Gala Final in the Ballsbridge Hotel by the esteemed panel of judges, with highlights of the evening to include a casino for all guests in attendence and a performance by singer/ songwriter and former Ireland representative at the Eurovision, Ryan Dolan...Picture:Brian McEvoy.